Okay, remember the deep drain we constructed in the back half of #9 green???? And remember the "Turf Guard" sensors that we bury into the turf which monitor moisture, temperature, and soil salinity?? Well I thought it would be interesting to use these sensors to evaluate the performance of that drain on #9 green. Check out the diagram of 9 green below. The two black lines define the location of the trench drain we installed. The three red spots indicate the location of the sensors. 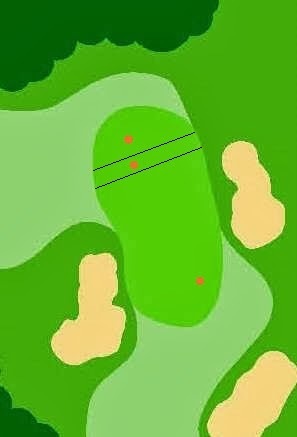 The sensor in the front of the green is measuring what I consider to be very satisfactory conditions. The front half of the green has never really had a serious drainage issue. Granted this is basically a "push up" putting green so it doesn't drain like a modern green. So, the fact that I condider the performance of the soil in this area to be satisfactory just goes to show how well our native soils drain. Anyway, if I can get the back half of the green to drain as well as the front, we would have no real issue and I wouldn't be writing this blog. Now the sensor in the drain is obviously measuring how well the new drain works. Lastly, the sensor in the back of the green measures what I consider to be unsatisfactory drainage which is why we installed the drain in the first place. When I placed these sensors, my hope was to determine wether or not the presence of the new drain would improve the drainage of the back half of the green or was it just helping the area immediately around the drain. By the way I installed the sensors just days before we went into a very unseasonable deep freeze. Again this winter we saw temperatures dip into the teens and we froze solid several inches deep. Check out the graphs below which shows you some of the really interesting data we collected. First, real quick look at the bottom graph which shows temperature. You can see all three sensors on a flat line during the first few days that are graphed. At this point the green was frozen so no matter what the outside temperature was, the sensor shows that the soil temperature pretty much stayed constant at freezing or 32F. You also can see that once the green thawed, the outside temperature had a direct impact on soil temperature since there is some nice peaks and valleys in the data. Cool stuff. Now lets get down to business and look at the moisture data which is in the top graph. Below you see a close up of that graph. I've labeled the three lines as "front", "trench", and "back". Start with the bottom light green line labeled "front". That's the data from the sensor in the front of the green which measures what I consider good drainage. You can see the sharp spikes which are havy rain events. Those spikes are pretty short meaning the rain events where heavy, but brief, and that the area in front of the green drains rather rapidly. Now look at the sensor labled "trench" which is obviously the sensor installed in the trench drain. The line is quite flat throughout all the rain events. Clearly the drain works well and not surprisingly drains faster than the soils in the front of the green. Now finally look at the dark green line labeled "back" which is the data gathered from the sensor in the back of the green. This is a clear picture and not a pretty one. As soon as the rains came, the soil became saturated and remained saturated. This is dissapointing as the sensor is only about 6 feet from the trench drain. Well..................okay, although it's dissapointing that the drain isn't helping a larger area, it's quite exciting to see how well the sensors show us what we were trying to determine. 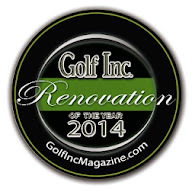 We know that we are not done with the back of #9 green. 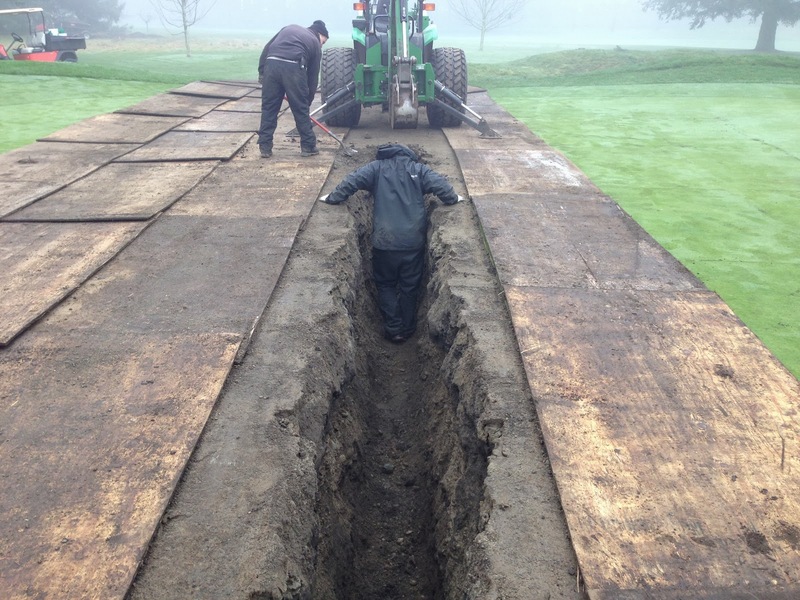 Somehow we have to find time to install more drainage into the area. The sensors cleary show that without more drainage, we will not be happy with how the back of the green performs in the future.